Established in 1965, family owned and operated Mike Howard Garage Doors is a full service garage door specialist. Together with their staff of estimators, service techs, installers they can make your home improvements or repair carefree. Did you realize that in most homes, your garage door takes up 40-60% of the front of your home. That is why most home owners have elected to update their homes with a new door. Specializing in custom wood & steel sectional doors to fit your home design. 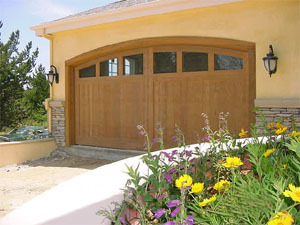 Mike Howard Garage Doors is an authorized dealer for Clopay Garage Doors, Raynor Garage Doors and Liftmaster Openers. They also work with a few wood door manufacturers that built standard wood sectional doors and custom carriage style doors. Mike Howard Garage Doors of Campbell was recently honored by Raynor Garage Doors for superior sales achievement. On April 5, Mike Howard Garage Doors received the Sales Performance Achievement Award at the Raynor Distributor Sales Conference in Miami Beach, Florida. The award was presented by Ray Neisewander III, executive vice president of Raynor Garage Doors and Todd Neisewander, regional distribution center projects manager. The Sales Performance Achievement Award is presented to Raynor distributors who have increased their annual Raynor purchases by more than 50 percent. For the award, Mike Howard Garage Doors Competed with more than 600 Raynor distributors from all fifty U.S. states, throughout Canada, and more than fifty countries worldwide. Mike Howard Garage Doors is located at 479 Salmar Ave. in Campbell. Based in Dixon, Illinois, USA, Raynor is a leading international manufacturer of residential and commercial garage doors, rolling service doors, counter shutters, traffic doors and automatic garage door openers. Visit our showroom at 479 Salmar Avenue in Campbell. Take Route 880/17 south to the Hamilton Avenue exit. Go straight through the light to Salmar Avenue. We are 1 block down on the right. Take Route17 north to the Hamilton Avenue exit. Turn left onto Hamilton Avenue. At the first light turn left onto Salmar Avenue. We are 1 block down on the right.